Is your Windows 10 hard drive starting to feel a bit cramped? A quick way to clear some hard drive space is to haul out the junk—that is, temporary files, old program setup files, cached thumbnails, and other bits of digital detritus that pile up over time. Read on for an easy way to clean junk files off your PC. I just ran a utility that lives in the Windows Control Panel—the classic Control Panel, not the slick new Settings screen for Windows 10—and found more than five gigabytes of unneeded files on my hard drive. You’ll find the Disk Cleanup tool in the old Windows Control Panel; just right-click the Start menu to get there. Among the biggest space hogs that Disk Cleanup found on my system were several gigabytes worth of so-called “temporary files,” or spare data from my various programs that are supposed to be regularly purged. The tool also found 274 MB of setup files used by Microsoft Office (which you don’t really need as long as you have your physical Office DVDs handy, or if you’re an Office 365 subscriber), 183 MB of “system error memory dump files” (which you can safely deep-six), and 164 MB of temporary Internet files, not to mention 116 MB of garbage sitting in the desktop recycle bin. The Disk Cleanup tool gives you a nice overview of all the junk files on your Windows 10 system, with files that you can delete without a second thought already checked. You can also click on other items in the list and decide whether you keep them or lose them after reading a brief description. 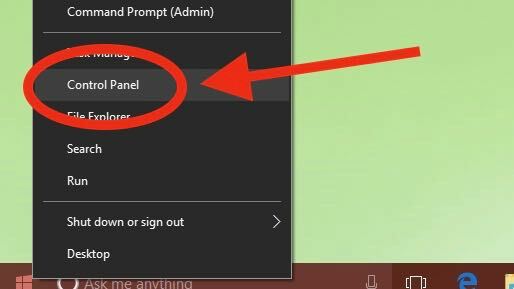 First, right-click the Start menu in the bottom-left corner of the screen, then click Control Panel. 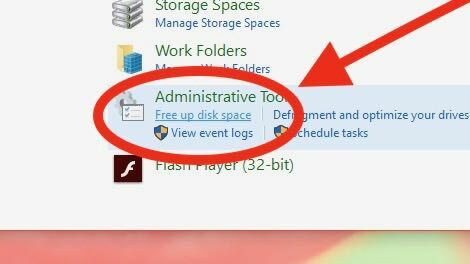 Once you’ve opened the Control Panel, you’ll find the “Free up disk space” link under the Administrative Tools heading. Next, click the System and Security heading, then click the “Free up disk space” link under the Administrative Tools section. If your PC has more than one hard drive installed, you’ll be asked which disk you want to sweep up. In a second or two, the Disk Cleanup utility should open, complete with a summary of potential files to delete in your Windows “user” account and the grand total of disk space they’re using. If you want to play it safe, you can stick to deleting the items that Windows has already checked for you—most likely “Downloaded Program Files” (basically, temporary helper files for viewing specific web pages), “Temporary Internet Files” (a cache of old web pages stored on your computer to speed your browsing), and Thumbnails (the tiny icon images used for music, videos, pictures, and other documents on your hard drive, which your system can always regenerate later). Just click the “OK” button to begin the cleanup. 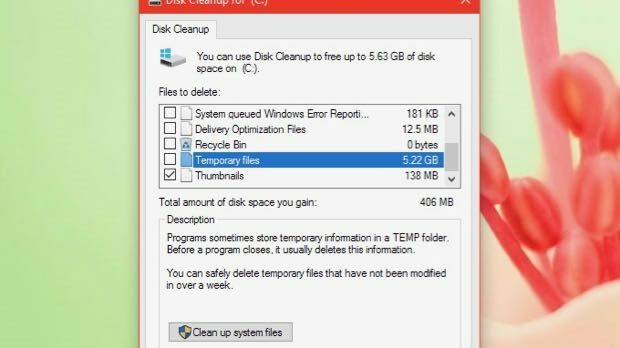 Make sure to read the description for each disk cleanup item before doing a clean sweep. Want to zap even more junk off your hard drive? Click the “Clean up system files” button, and Windows will scour your entire hard drive for old files to delete—previous Windows installations, for example, or file fragments that were saved following automatic hard-drive maintenance. Click each item in the list, read its description, and check the box next to the items you want deleted. Once you’re all set, click the “OK” button. 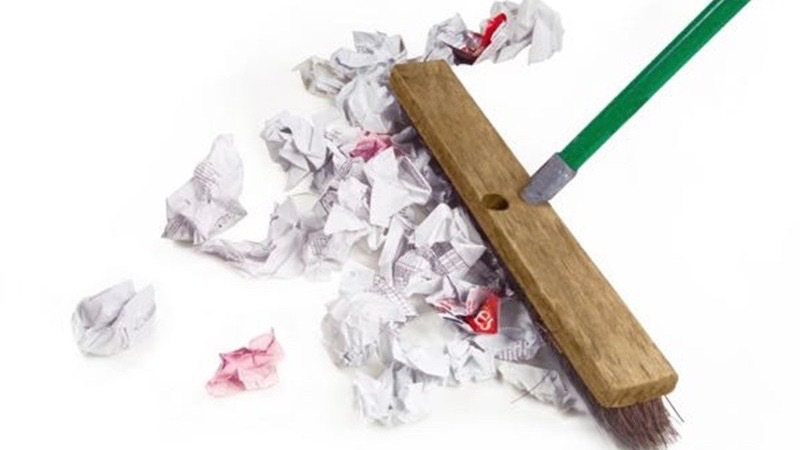 Keep in mind that some “junk” files may actually come in handy in certain situations, so read the file descriptions carefully before doing a clean sweep. After clicking the “Clean up system files” button, you can also click the “More Options” tab to check for rarely-used programs or old system “restore” points to delete. Also, it’s always a good idea to back up your system before you start purging files. Check out Microsoft’s Windows support site for its official back-up instructions.